Rescue the villagers scattered around Deleyn's Mill. The village of Deleyn's Mill is under siege. Fire threatens to burn the village to the ground while enraged forest creatures attack the remaining villagers. The witches of the Beldama Wyrd are trying to contain the situation. I should help them. Collect water from the well. Put out the fires and find the villagers. To start this quest talk to Wyress Jehanne inside the mill at Deleyn's Mill. She asks you to put out the fires around the mill and save any survivors.Go to the well just outside the mill entrance and fill a bucket then go northeast and put the fire out in front of the house. Enter the house and talk to Mura then leave the house. Go east now to find wooden logs jump on a stump and then over to the top of the logs. Speak to Shawna Loghammer. Jump down and go south around the hill. When you get around the hill continue south and talk to Gailen Tramnil who's hiding in a boat filled with logs. Climb back up from the boat and walk onto the docks then go south till you reach the end. 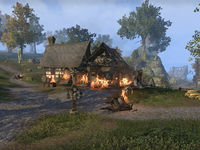 Talk to Luzmash who is hiding behind boxes then go back to the beginning of the docks and head northeast to the house. Go into the house and put out the fires then talk to Wyress Olyna. Go back to the mill and talk to Jehanne for your reward. I need to search for surviving villagers and send them to the mill. While I'm doing that, I should put out as many fires as I can with water drawn from the village well. I extinguished many of the fires and sent the surviving villagers to the mill. I should return to Wyress Jehanne and see what else needs to be done.